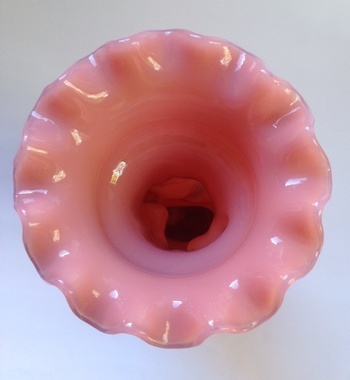 This Victorian glass hand vase by Portieux/Vallerysthal is made from opaque pink glass, which is a very uncommon colour for this piece. They are commonly found in turquoise blue & opaque white, but other less often seen opaque colours include jade green, caramel, & yellow - green. I have all those colours, but the pink was the only one I hadn't found up until now, so I'm very pleased to have an example at last. It measures 20 cm tall, 9 cm across the crimped top rim, & 8 cm across the base. Beautiful and interesting piece Lace!